Going away for a honeymoon after getting married is a tradition that dates back hundreds of years. 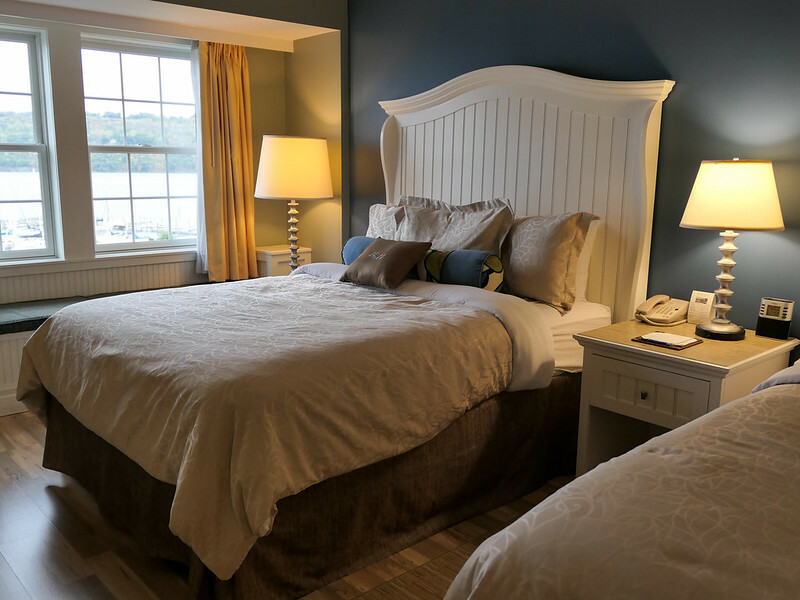 Today, a honeymoon is traditionally taken to somewhere exotic and maybe a little luxurious – or at the very least kind of far away from home and all the family you've been entertaining while they were in town for your wedding. When thinking about our own post-wedding honeymoon, Elliot (my now-husband) and I knew that we wanted to go somewhere epic. I wanted to take him to New Zealand, my favorite country and a place he'd never been. But I wanted to go in New Zealand's summer/autumn months, which didn't really line up with our October wedding (October is early spring in NZ). So we decided to postpone our “big” honeymoon to March and go on a “mini-moon” immediately following the wedding instead. Elliot and I on our mini-moon! A mini-moon is exactly what it sounds like: a “mini” or shorter honeymoon, usually taken somewhere closer to home. It had to be within a half-day drive from where we live. It needed to be somewhere neither of us had been before. It had to be somewhere that we could easily spend 3-4 days without being bored OR overwhelmed. In the end, we decided on the Finger Lakes region of New York state. It was a place neither of us had been (but one that I'd been invited to explore as a blogger a couple times in the past), was only a 4.5-hour drive from home, and was a great mid-October destination. Elliot and I aren't your “typical” newlyweds. Since we've been together (and lived together) for years, we didn't really want the type of honeymoon where we'd hide away in a resort and do pretty much nothing for 4 days. Instead, we wanted a little big of variety and adventure to go along with a dash of newlywed romance. We discovered that there's a lot more to do in the Finger Lakes region than most people realize. 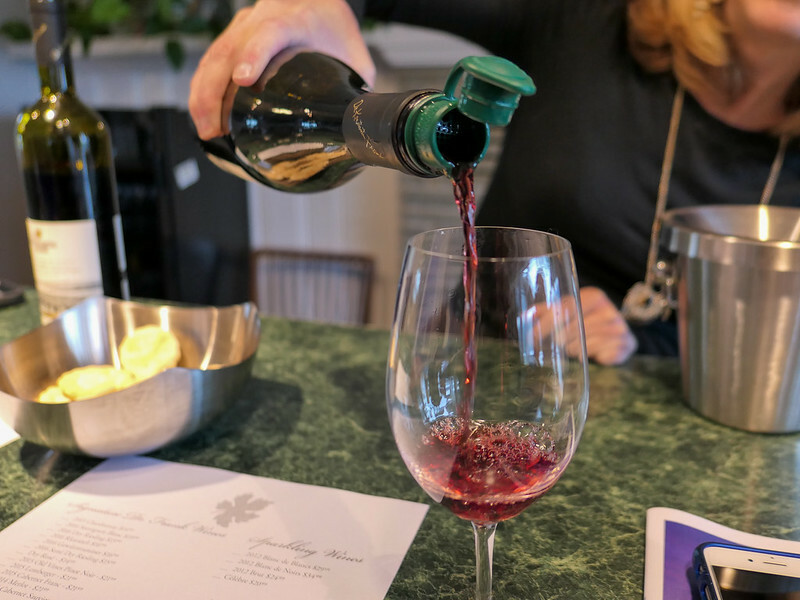 The Finger Lakes region is quite well-known for its wineries, so it's no surprise that there are multiple “wine trails” to choose from. The largest is the Seneca Lake Wine Trail with 35 member wineries, but you can also check out the wine trails around Cayuga and Keuka lakes. 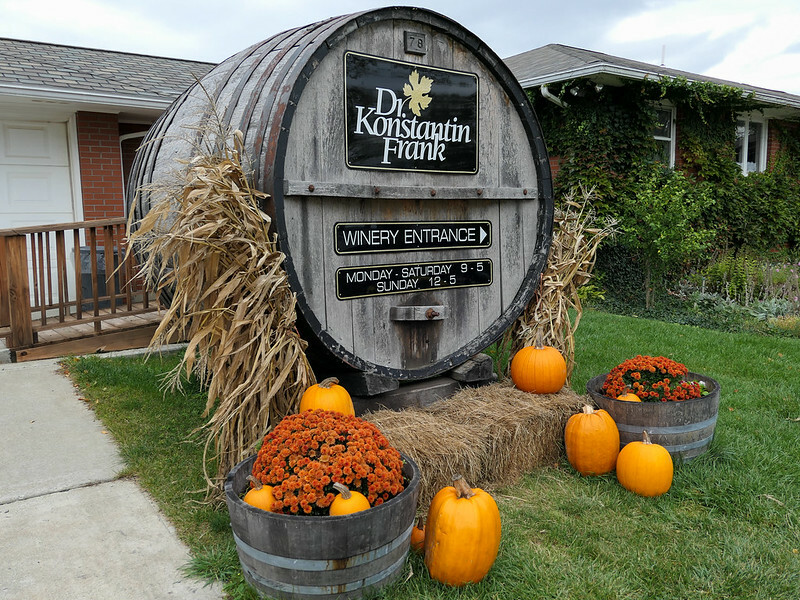 Elliot and I visited two wineries near Keuka Lake – Bully Hill Vineyards and Dr. Konstantin Frank Wine Cellars. Dr. Frank's (as it's often called colloquially) is famous for being the place where the first Vinifera vines were planted, sparking a renaissance in winemaking in the United States. But don't stop just at wine – the Finger Lakes Wine Country is home to more than 100 wineries, breweries AND distilleries. 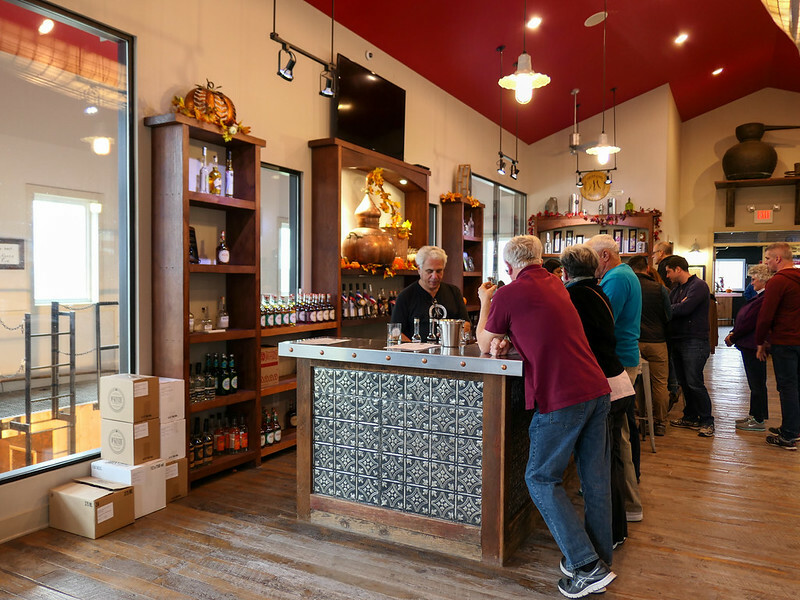 There's the for those who love craft beer, and Finger Lakes Distilling for those looking for some locally-crafted spirits. Elliot especially loved our distillery visit, where we got to try whiskey, gin, vodka, and even soju that are made with local grains and grapes (yes, they make a lot of their alcohol using area grapes and wines!). And if you *both* want to enjoy the local wines and spirits safely? Consider booking yourself on a day trip that includes transport, like this , this , or this . In the Southern Finger Lakes on the shores of Seneca Lake you'll find the small town of Watkins Glen. This little town is most well-known for it's state park, which features a waterfall-filled gorge. Elliot and I spent a couple hours walking the gorge trail and taking photos of ALL THE WATERFALLS. Pro tip: Allow at least 2 hours to walk the entire gorge trail out and back; more time if you know you're prone to taking copious amounts of waterfall photos like me! And be aware that there are about 800 steps to go up/down along the trail, depending on which direction you're going. Don't let the number of steps dissuade you, though – the Gorge is so worth it! After checking out all the waterfalls in Watkins Glen State Park, we also went to see a couple in the tiny town of Montour Falls – because you can never see too many waterfalls, right? Montour Falls has a waterfall at the end of Main St.! And don't skip the short walk in Havana Glen Park to see Eagle Cliff Falls – it's beautiful! 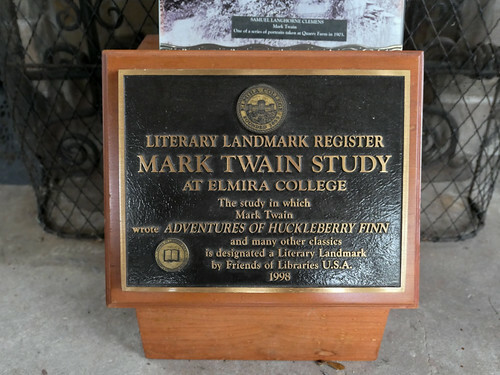 When in Elmira, Twain and his family usually stayed with Olivia's sister Susan Crane at Quarry Farm. 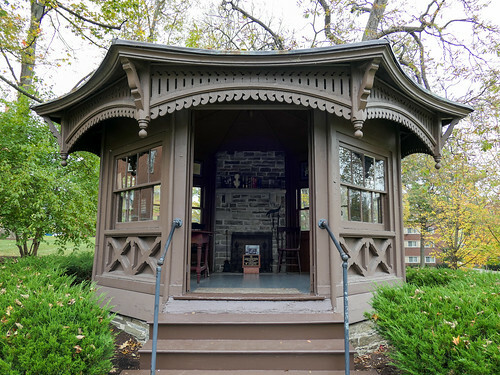 Twain complained that there were never any quiet spaces for him to work and write, so he had a small study built on a hill away from the house. It was in this study that Twain wrote many of his famous novels, including The Adventures of Huckleberry Finn. The study was eventually moved to the campus of Elmira College in order to preserve it, and now you can visit it! 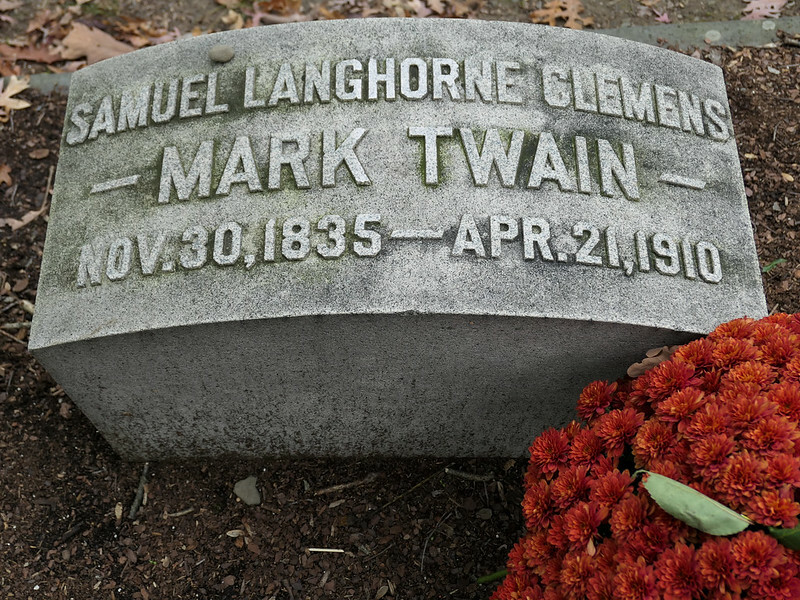 The whole Clemens family is buried in Elmira. 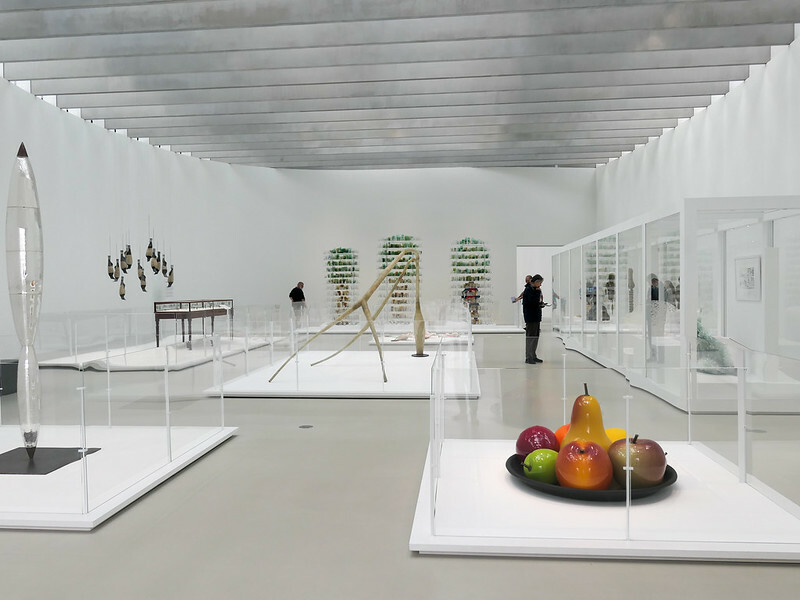 The town of Corning is a bit south of the Finger Lakes themselves, but is definitely worth adding to your itinerary, especially if you love art! 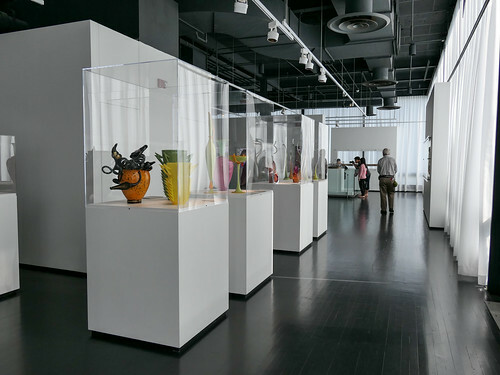 Corning is known for its glass-making, and is home to the Corning Museum of Glass. The museum itself is striking in its architecture. We spent half a day at the Corning Museum of Glass admiring its exhibits and gawking at all the cool glass demonstrations. You can even blow your own glass here for a fairly reasonable price, which is really fun! And the town of Corning itself is super cute. I highly recommend spending some time shopping along the main street in the Gaffer District. Here you'll find a mix of boutique shops and restaurants – head to Vitrix's glass studio if you want to pick up some locally-made glass at fairly reasonable prices. So how do you turn these itinerary suggestions into a romantic mini-moon? I think a lot of it has to do with where you stay. There are so many adorable little towns around the Finger Lakes, and plenty of unique hotels and B&Bs to choose from. Our room at the Watkins Glen Harbor Hotel was beautiful! We also stayed at the , which is perfectly positioned for exploring the Gaffer District. Another big highlight of our mini honeymoon in the Finger Lakes was all the delicious food we ate. I'm not usually a foodie, but we had so many good meals in really cool spots that I decided I had to highlight the best ones! My favorite place we ate was in Corning. It's a modern fusion restaurant that has a huge wine menu (presented on a special iPad) and some really cool tapas dishes. 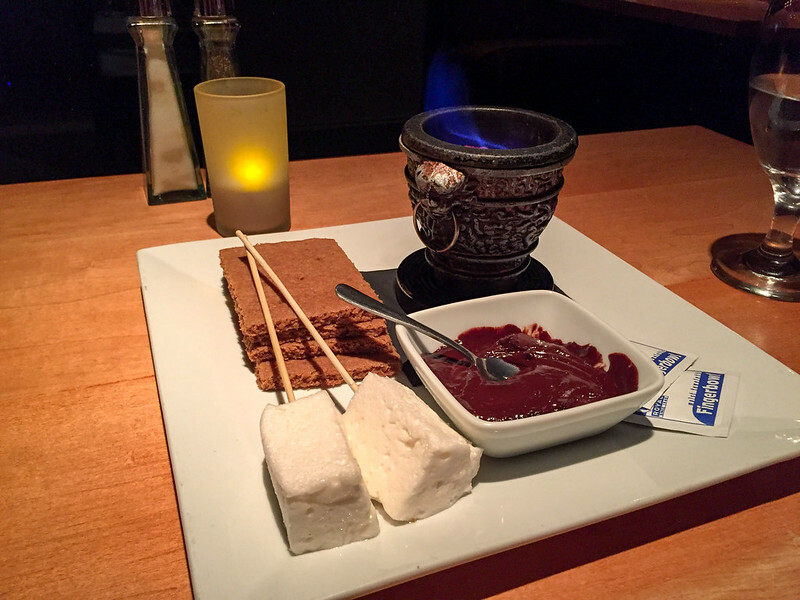 Elliot got a bowl of pork ramen that left us both drooling, and for dessert we had s'mores complete with “tableside campfire.” Everything was delicious, and it was just a really fun dining experience. With a name like “The Elf in the Oak,” how could it not be an awesome spot for lunch? With an emphasis on homemade sandwiches served up in a cozy cottage-like setting, we thoroughly enjoyed this spot. They have a nice patio, too, with views out over Seneca Lake. 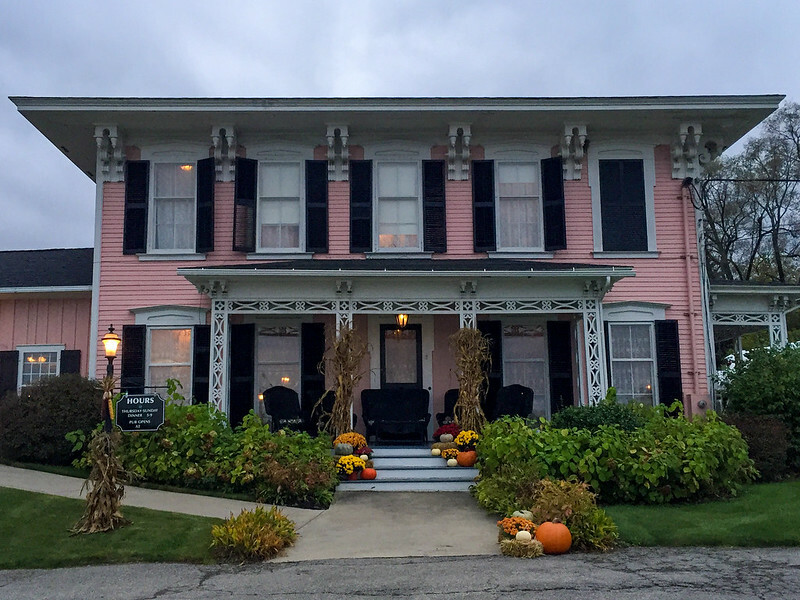 If upscale dining in a historic home is more your style, check out the Pleasant Valley Inn in Hammondsport (it's right across the street from the Vinehurst Inn). I was obsessed with the cool wall paper inside, and the fact that they do a caramel popcorn sundae for dessert. I can also recommend eating at Bully Hill Vineyards, Louies Hanover Square in Horseheads, Glen Mountain Market Bakery & Deli in Watkins Glen, and the Market Street Brewing Co. in Corning. Want to add some extra romance to your Finger Lakes honeymoon? Go for a massage – we did a couples' massage at the Namaste Event Spa & Wellness Center in Horseheads. Take to the skies – you can go for a seaplane tour of the region with , which would be especially beautiful in the fall. Sadly it was too windy for us to do this when we were there, but it certainly would be a perfect honeymoon activity. 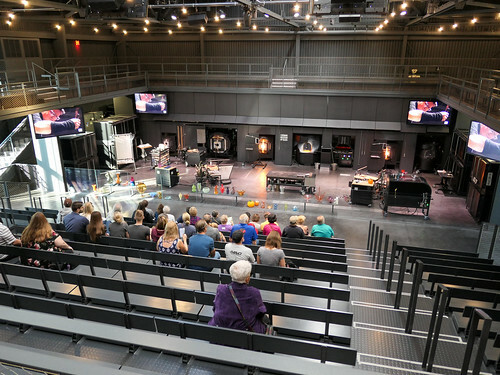 Make art together – I mentioned earlier that you can make your own glass at the Corning Museum of Glass, which is a perfect activity for couples. Make ornaments or a picture frame together, or maybe sand-blast some cute Mr. and Mrs. pint glasses. So who's ready to plan a mini-honeymoon (or even just a weekend getaway) to the Finger Lakes? Thanks to Corning and the Southern Finger Lakes for hosting us on our mini-moon. As always, though, all opinions are 100% my own. This sounds like a great little getaway trip! I have seen photos recently of this area, but wasn’t all that familiar with it otherwise. Definitely a place we’ll put down to check out as we’ve been wanting to explore the side of New York that isn’t the big city. We also had a similar plan in that we got married back at the end of July in Grand Teton and want to go to New Zealand for our honeymoon. But with our schedules, we have to aim for big trips in the summer, or during their fall/winter. In the interim, we have a couple of small, getaway trips to tide us over until then! This is a great part of New York to spend some time in. It’s completely the opposite of NYC! Damn, the place looks so promising for a relaxed holiday; no doubt you chose it for honeymoon. Waterfall at the end of the main street, COME ON! Perfect! If you love waterfalls, this is the place for you! And yes, we had a very relaxing time, though still had plenty of adventures too! This looks like a great place for a mini-moon (I had never heard about that, but it’s sticking around now!). The waterfall that towers over the main street looks beautiful! We enjoyed it and I would definitely go back! This sounds like the perfect not-quite-on-the-international-tourist-trail destination. Being someone who is not married or in any relationship at all, I must also say that it seems like it would also be a great place to head with a couple friends? Also I’m not sure if I ever said it, so congratulations to you and Elliot!! The Finger Lakes would also be great for a girls’ getaway, or a trip with any friends; there’s a lot to do and see! Congratulations once again Akatuki. I wish you and Elliot the very best on your path to married life. 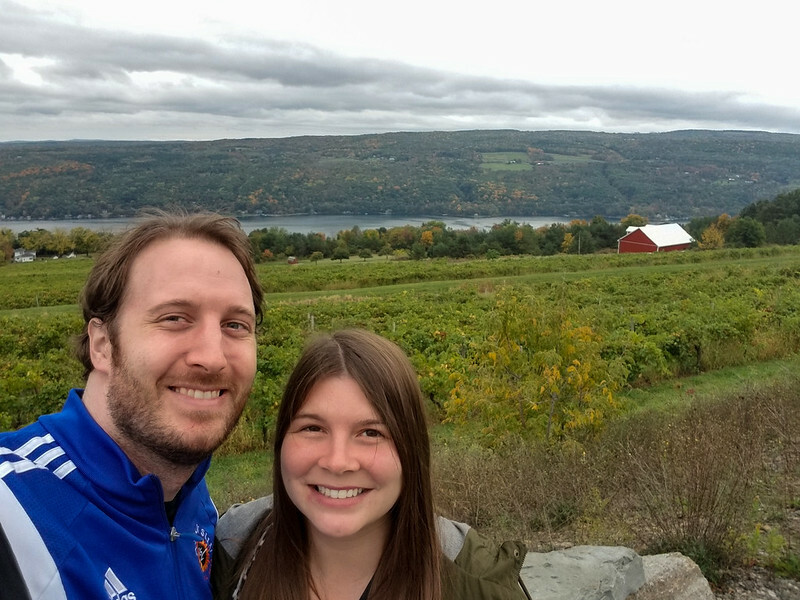 We absolutely love the Finger Lakes! There’s so much to do in any season you go! Beautiful shots of Watkins Glen! I can’t believe I’ve never been! Definitely something for everyone there. Был найден мной популярный веб портал , он рассказывает про Пептиды.